This charming two story log cabin is on 1.3 acres of wooded property nestled in an aspen grove near the quaint little mountain town of Allenspark, about 15 miles from downtown Estes Park. Enjoy all the amenities provided by Estes Park and Rocky Mountain National Park without the crowds! Play all day in Estes Park or Rocky Mountain National Park or any of the dozens of nearby attractions and then retire to this quiet piece of heaven where you can sit on the deck, unwind and actually hear the sounds of the mountains. WiFi is available. Allenspark has a wonderful cafe for breakfasts and lunches as well as a five star gourmet restaurant for fine dining! The village is a perfect place - easy to reach from the Denver International Airport and yet a spectacular, serene, relaxing mountain retreat. Things to do: On the doorstep of the Rocky Mountain National Park, you can enjoy a variety of activities all year round -- from leisurely hikes to vigorous mountain climbing, horseback riding, fly-fishing, snowshoeing, downhill skiing, ice skating, cross-country skiing, sleigh rides and much more. Alternatively, you can simply relax in your romantic cottage and enjoy the peace and beauty of your surroundings, the wildlife and the mountain views. By night, enjoy wine by a crackling fire in the stone hearth. By day, explore the majesty of the Rockies. 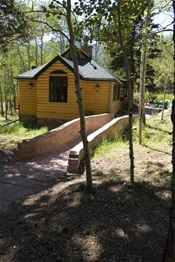 Wake up to a sparkling mountain view through the aspens. Cook traditional family recipes in the well-equipped kitchen. Play games in the sunroom. This cabin is romantic for just two but able to handle a crowd. Glorious in the summer; intimate with warmth in the winter, it is a peaceful retreat. Cabin layout gives private space to guests: The Master bedroom has a private balcony overlooking a secluded view of aspens and pines. The second bedroom on the main level has it's own upstairs bedroom, and the upper level bedroom has an attached sleeping loft. This house is loved by all. Come see for yourself! Is this cabin available Oct 4-6?